On the engagement ring hunt? Congrats to you! 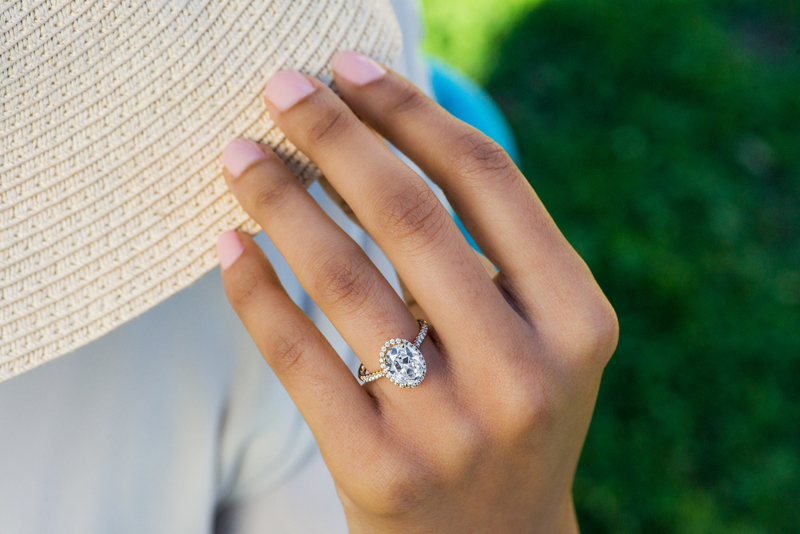 For most people, buying an engagement ring is an entirely new experience – one that can feel very overwhelming. But it doesn’t have to be. 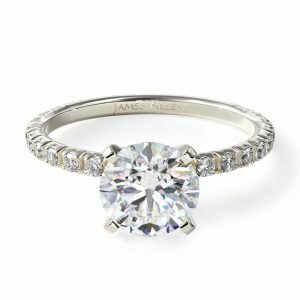 With the help of JamesAllen.com, the true experts in buying an engagement ring, we’ve put together all the information on how to buy a diamond in a simple, straightforward way so you can make the right choice for you and your soon-to-be fiancé. The first thing to know is that all loose diamonds from JamesAllen.com (and any reputable jeweler) are graded and certified by an independent laboratory. Their grade is given unbiasedly based off of a few scales that organizations like the GIA or AGSL use. The grade a diamond is given directly affects how much you pay for it, which is why buying a certified diamond is very important. That being said, two diamonds with the exact same specs on a certificate can look, and be priced, very differently. To truly understand your diamond and it’s pricing, it’s critical to see the diamond before you buy. JamesAllen.com stands apart from the pack with their Diamond Display Technology. You can see each and every one of their 150,000+ conflict-free diamonds in 360 degree HD – an even better view than what you get with a jeweler’s loupe. Next, the major characteristics in a diamond buying guide are (including the 4 c’s of a diamond! ): SHAPE, CUT, COLOR, CLARITY, and CARAT WEIGHT. Let’s go down this list one by one. The shape you choose – which is typically based on personal preference – can change what qualities to look for in each diamond. Therefore, you should pick 1-3 shapes to look into and find out all there is to know about each shape. 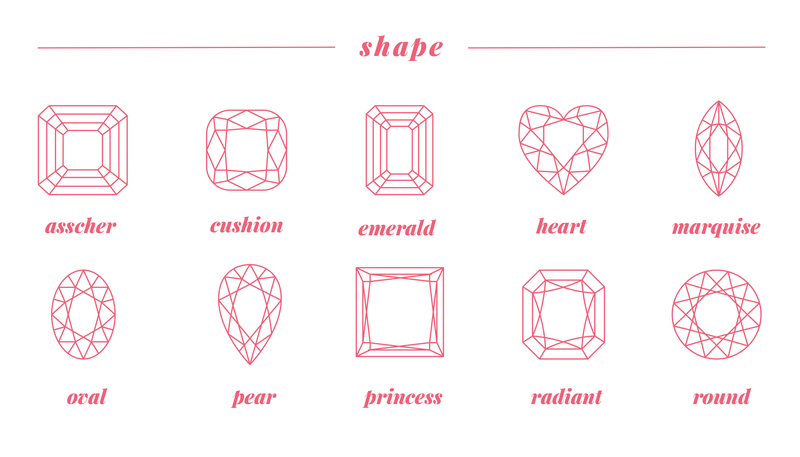 Below is a chart of engagement ring shapes, and you can use JamesAllen.com’s diamond gallery to select a shape and see 360 degree HD images of those diamonds. The cut of a diamond determines how light moves through it and ultimately determines a diamond’s brilliance – AKA its sparkle or shine. It’s the most important characteristic in a diamond because it has the greatest overall influence on a diamond’s appearance. 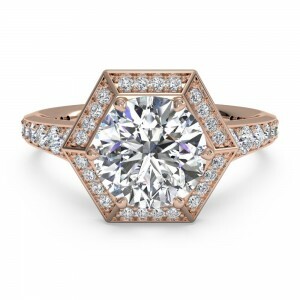 The sparkle of a well-cut diamond can also make it appear larger (which most people would tell you is a huge plus). 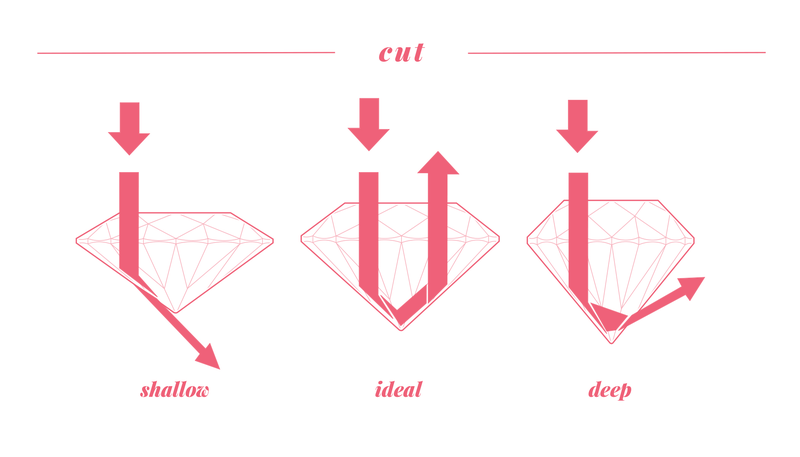 When a diamond is cut with the proper proportions, light is returned out of the top of the diamond (see the “ideal” visual below). If it is cut too shallow, light leaks out of the bottom. If it’s too deep, it escapes out of the side. You want the light to reflect out of the top of the diamond, also known as the table, to get the most sparkle. In the diamond world, when we talk about color, we’re actually referring to a diamond’s lack of color. Colorless diamonds are the best quality, as they appear the whitest. The highest grade is a D and the scale goes all the way down the alphabet to K-Z, at which point diamonds begin to have noticeable color. JamesAllen.com only carries J or higher which is a safe cut off to stick with no matter where you buy. D Absolutely colorless: The highest color grade; Extremely rare. F-E Colorless:Minute traces of color can be detected by an expert gemologist; A rare diamond. H-G Near-colorless: Color difficult to detect unless alongside diamonds of better grades; An excellent value. 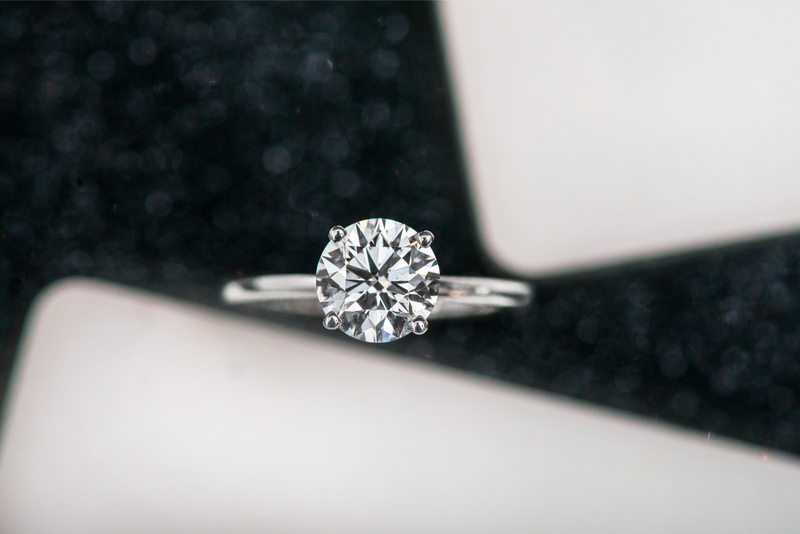 Clarity refers to the tiny, natural imperfections that occur in all diamonds (except the very, very finest diamonds). Gemologists refer to these imperfections by a variety of technical names, including blemishes and inclusions. Diamonds with the least and smallest imperfections receive the highest clarity grades. Because these imperfections tend to be microscopic, they do not generally affect a diamond’s beauty in any discernible way. FL: Flawless, Internally Flawless // No internal or external imperfections. IF: Internally Flawless: No internal imperfections // Very rare. VVS1 + VVS2: Very, Very Slightly Included // Very difficult to see imperfections under 10x magnification. An excellent quality diamond. VS1 +VS2: Very Slightly Included // Imperfections are not typically visible to the unaided eye. Less expensive than the VVS1 or VVS2 grades. SI1 + SI2: Slightly Included // Imperfections are visible under 10x magnification, and may be visible with the unaided eye. A good diamond value. I1: Included // This grade of diamonds will have minor inclusions that may be visible to the unaided eye. Carat is a measure of a diamond’s weight. 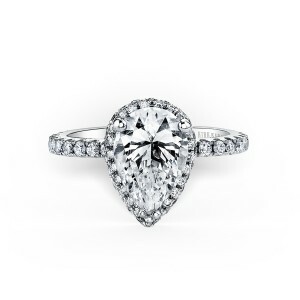 It does NOT fully reflect the visual size of a diamond as most people casually believe. We often think that more carats means a bigger diamond but there is more to it than that. 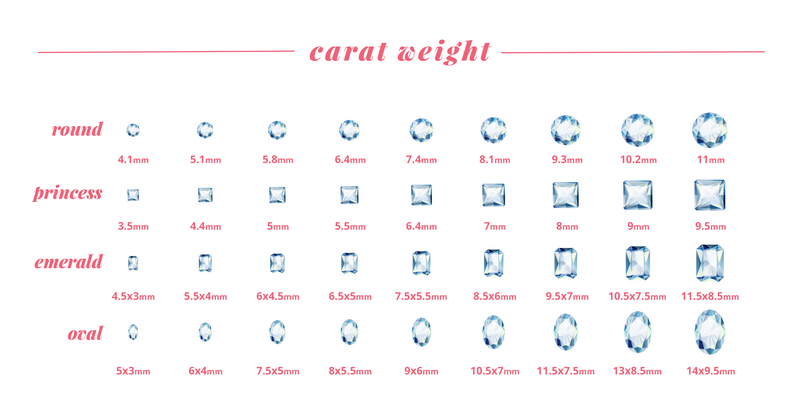 It’s important to look at the carat weight alongside the cut and measurements. If a diamond is poorly cut, the weight could be “hidden” in the base of the diamond. It is just as important to measure the distance across the top of the diamond (aka the table) as this is how we view a stone when it is set into a ring. That about sums it up! With a basic understanding of the grading scales, you should feel more prepared on how to buy a diamond. It’s not as crazy of a process as you might fear, and becoming educated on it is a big part of all the fun. It’s your moment to shine (alongside the ring) and we’re very excited for you to find your fiancé’s dream engagement ring! If you have any unanswered questions, JamesAllen.com covers everything you need to know. They go into figuring out your budget, finding the right metal, fancy colored diamonds, and more! Good luck, and let us know how when she says ‘yes’!